Think about the last article, video, or picture you shared with your network, or that you emailed your friends and family. Jonah Berger can tell you exactly why you shared it. A Wharton marketing professor and author of Contagious: Why Things Catch On, Berger has uncovered the science behind why some ideas, brands, and products spread like wildfire, and why others don’t. Here’s why this matters: your reputation as an employer is everything. Get the right people talking about your organization as a great place to work, and recruiting high-quality talent becomes that much easier. You already know that having a content strategy for your talent brand is crucial in the digital age.But merely having a Facebook or LinkedIn Company Page won’t cut it, says Berger. If you use these STEPPS (or as many of them as possible) when crafting content for your talent brand, your employees and candidates will be more likely to share it, and thus the further your messages will go. People care about what they look like to others, so they are more likely to share content that makes them seem smart, cool, or in-the-know. It’s hard to believe that a video about a blender could get hundreds of millions of views on YouTube. But Blendtec crafted a series of low-budget videos called “Will it blend?” putting various objects like marbles, golf balls, and even an iPhone in its blender. The videos showing these smashed up things were so remarkable that people felt compelled to share them, and sales skyrocketed as a result. People advertise their own identity when they share your content, so cater to their desire to look good, whether it be funny, clever, or some other desirable characteristic. HP does a nice job of this with its status updates on LinkedIn, e.g., its links to interesting research such as the below. The company gives its audience a way to appear in-the-know, and HP’s talent brand benefits as a result. People are more likely to share and talk about things that are already top of mind. Find a much talked-about cue that you can associate with your talent brand, and it’ll make people talk about you more. In his book, Berger talks about how Kit Kat tied its ad campaign to drinking coffee. “Kit Kat and coffee” doesn’t sound like a brilliant brand message, yet sales soared. By associating the brand with coffee, a common cue in everyday life, people were triggered to reach for Kit Kats on their breaks. Elon Musk tweets about the Hyperloop, engaging his audience and getting the right people to talk. High-arousal emotions such as awe, humor and excitement fire people up, and that drives them to share. 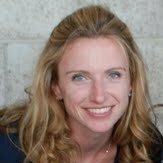 Berger and his colleagues studied the The New York Times Most Emailed list – a collection of over 7,000 articles written over a six-month period. The data showed that people were much more likely to share articles that got their heart rates up, whether for positive or negative reasons. Share content just for fun once in awhile. Make people laugh and they’ll feel more positively toward your company. Go for awe and excitement over less arousing positive emotions like contentment, which don’t compel people to share. Check out this video on work life at Dropbox. I dare you not to laugh. People have to see what others are doing and experiencing in order to want to imitate it. Every year Berger asks half of his second-year MBA students what they wanted to do professionally when they started the program, and the other half what they want to do now. He finds that before the program starts, there’s a diverse set of interests among students, from entertainment to politics. But a year into the program, more than two-thirds say they want to go into investment banking or consulting. “This herding is driven by social influence. People aren’t sure what career to choose, so they look to others. And it snowballs,” he says. Consider the employee who shares a photo from the company offsite, or the appreciation award she received, or a picture of her workspace. The right people in her network see that and think, that looks like a great place to work. Or, that company really appreciates its employees; I could see myself there. Herd mentality rules: to encourage employees to share content, you, your team, and the executive team need to lead by example, sharing and engaging with the content your employees share. The more observable and public you can make your culture, the more likely your targets will want to be a part of it. 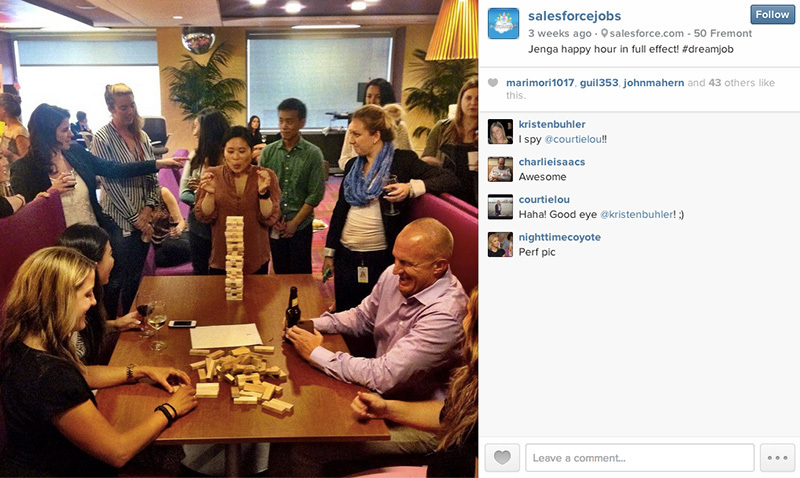 Here’s Salesforce.com using Instagram to make its fun office culture more public. People share useful information, plain and simple. Useful things are important, and they get shared. Package your company’s knowledge and expertise so that employees and candidates can easily pass it on. Share how-to articles and thought leadership pieces, content that makes them faster or better at what they do. Providing useful information strengthens your bond with your prospects. Remember to appeal to their professional interests and aspirations. The more relevant your message, the greater its impact will be. For example, you might share career advice with students but technical tips with experienced engineers. Here’s Twilio sharing code on its LinkedIn Company Page – real practical value for certain engineers. People are more likely to share a memorable story than facts and figures. Stories are vessels that carry your message. Do you remember Jared Fogel who lost 245 pounds eating only Subway sandwiches? People didn’t talk about how many grams of fat were in the sandwiches; they talked about Jared, the overweight college student who slimmed down by eating subs for lunch and dinner every day. Subway benefitted because it was part of the narrative. It’s one thing to say you have a fun office culture. It’s another to talk about your team going out for drinks last Friday and doing karaoke until 1am. Find your “Trojan Horses” that will carry your talent brand story along for the ride. Soliciting and sharing employee stories is a great way to do that. Watch Starbucks employee Brad Porter tell his “Working Toward a Dream” story in which he shares his aspirations to be a musician and artist. Starbucks merely plays a supporting role. So the next time you share a piece of content online, make sure you are using at least one of these six STEPPS: your audience will be more likely to share it, and thus your brand message will be more likely to spread. Don’t miss Jonah Berger live at Talent Connect 2014 in San Francisco (Oct 20-22).